(VIDEO) Water is the Most Critical Item to Store. 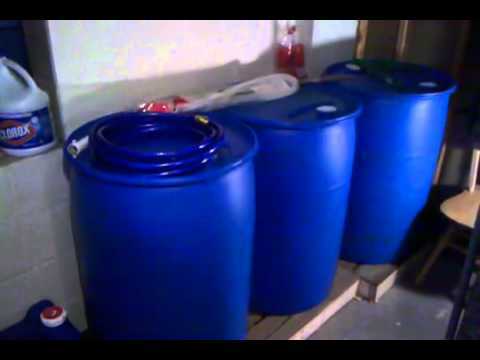 This Prepper Shows Us How You Should be Storing Water Before SHTF. Water is one of the single most important preps you'll ever need to consider in your long term survival plans. Without enough water, much of your food will be useless, particularly if you are relying on a great deal of MREs or other freeze-dried foods. If you have a great deal of grain or flour stored, without enough water to make anything out of these materials, you may as well not be storing any food. To digest any of the food you cook, you'll need plenty of water to flush it through your system. For those reasons, it's important to store or be able to obtain as much water as you can get your hands on for the long term. But even more important than that is the necessity to have a backup plan. And a backup plan for your backup plan. And so on and so forth. The video on the following page explains how to do this properly. Do u treat the water in the blue barrels with like chlorine? I have an big$#%&[email protected]*aquarium filtering system attached to my drums, each hooked up to each other, the pump filters and airates the water there by keeping it fresh. thanks for sharing. With all that is happening with our climate, we need to protect ourselves. Our government won’t. I have a well with water in it. Don’t need to store water. Take one 50 gal drum. Drill holes in the bottom of it, maybe 20. Definitely boil if resources available. Always wait 30 mins to an hour if adding bleach or KmNO4 (Potassium Permanganate). This is a very popular backwoods water filter that has grown in popularity, mainly bc materials are in your backyard and man-made chemicals are easily extracted from the charcoal itself, as most water tables are polluted with industrial or agricultural chems. Wells run dry, or get contaminated. Then what?$#%&[email protected]*happens. Prepare for the unexpected. What if Allah Bob takes a crap down your well?